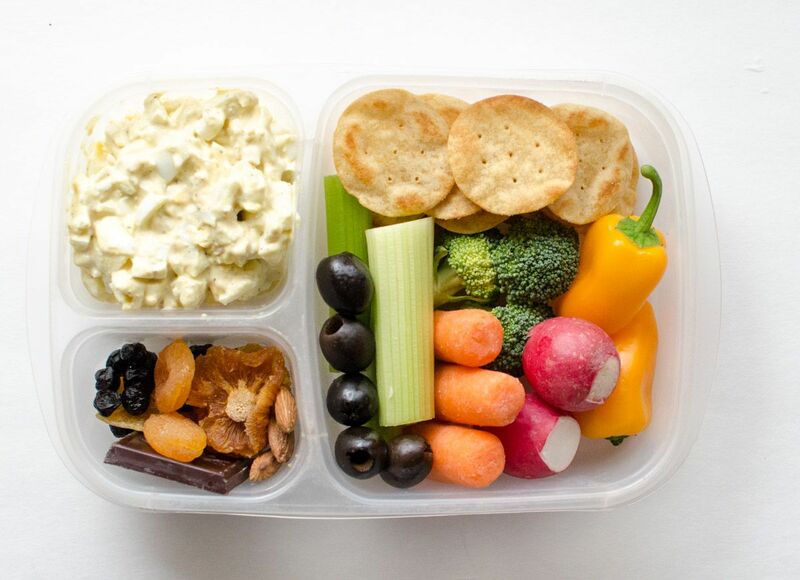 Packing lunches for the office is a never-ending problem! Continually stuffing last night’s leftovers, sandwiches or salads into a plastic box will eventually drive you to look for fast-food outlets! That is the last thing that you want to do, as it will cost you an arm and leg and prove very unhealthy. Spend a little time searching the internet for some alternatives. You may have to devote some time in the evening to preparing something that is easy to pack, but there are loads of easy recipes that will make great alternatives. I would like to suggest a delicious alternative that is not only tasty but very healthy as well. 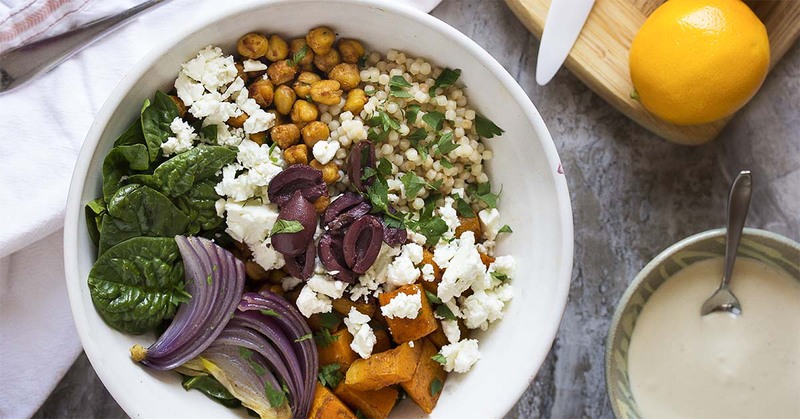 A Buddha bowl is named after the big, round belly generally associated with statues of Buddha. It is a one-dish meal that is nutritious, healthy and filling. At the supermarket, walk past the bland iceberg lettuce and pick up packs of kale, baby spinach and arugula. These lovely green veggies will form a base for your lunch and give you loads of valuable minerals and vitamins. Now that you have a nice layer of veggies, let’s put some grains on top. Look for quinoa, brown rice, farro or barley. Cook them according to the package instructions, and when cool, these grains can be kept in the fridge for a couple of days. 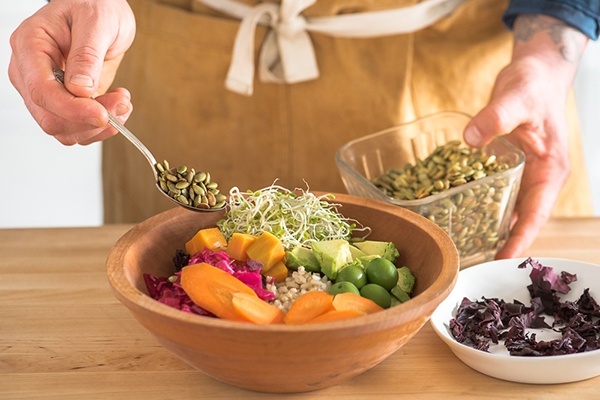 Take a good few spoonful and add it to your growing Buddha bowl. All of these grains have loads of vegetable protein and will digest slowly, keeping you feeling full for longer. There are loads of other veggies that, once roasted, will make a fabulous addition to your bowl. Look for butternut squash, pumpkin, sweet potato, courgettes, bell peppers, mushrooms, peas and beans. Any of these can be roasted and kept in an airtight container. Spoon a few into your bowl for added color and sweet, nutty goodness. If you can find avocados, then dive in. These are chock-full of all kinds of goodness, so squeeze a little lemon juice over the flesh and cut that creamy goodness into your bowl. Everyone loves some crunchy bits, and nothing is better than nuts and seeds. There are many mixes available in your local supermarket, so browse the shelves and look for something to add a little crunch. It is not necessary to add any proteins, but if you want to add some roasted chicken or other meat, then go ahead. Try making your bowls without animal proteins for meat-free days. Now that the bowl is mostly done, you can add that last little bit of pleasure by dropping in some cheese and a little bit of zingy dressing. By following these guidelines, you have a meal that is nutritious, inexpensive and healthy. Add a fork or spoon and tuck in!